Thanks so much for hanging in there with me! Its been crazy busy! My youngest daughter is a cast member of The Addams Family, a ridiculously funny musical and I am helping back stage! But for someone that has a confirmed 8 o'clock bedtime, going to bed after midnight six nights in a row is putting the hurts on me, big time! But I love the theater and I'm so glad to be part of all the magic that can only happen in live theater. My card today features one of the stamps from Bird Crazy by Tim Holtz. All of the birds in this set makes me laugh, which is a very healthy exercise! 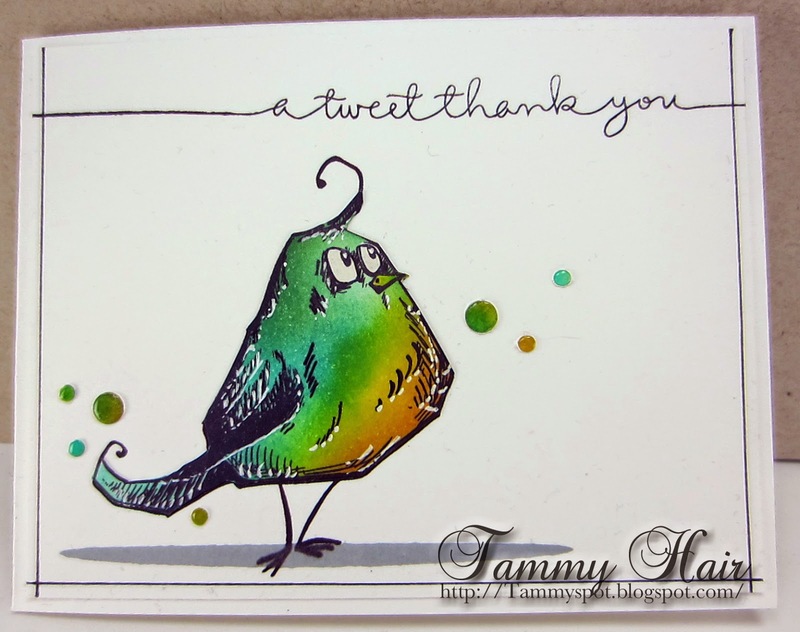 I love TH birds and you card is brilliant too. Fabulous card Tammy, I love the fun image and wonderful colours. Well done to your daughter, it must lovely for you to get involved too. Way to go, Tammy! Lovely card and image, but it should have been a night owl. Don't you overdo it either. ha ha. I have been seeing these Tim Holtz birds everywhere! They are so stinking cute, Tammy! And what beautiful coloring on this one! Oh your birdy is just so sweet!! Brilliant card Tammy! I love your story too! What fun to be helping out backstage! Hope the run goes well & you can get back to your proper bedtimes soon! Those crazy birds always make me laugh too! Love yours Tammy! Great coloring and cute way to doodle in that sentiment. Fabulous card and amazing coloring. When I first saw this stamp set, I thought you might like it :-). What I've seen of these birds is absolutely fabulous, but your coloring is what really makes them really special. I love this green, amber, yellow blend. I see it's almost 9:00 here now and I'd be much better off if I hit the hay shortly, but I never seem to know when to quit, even though I'm so much more productive in the morning. It sounds like you're having some pretty exhausting fun! What a fun card. I think I might "need" these birds! I found your blog on Lynn's blog and I absolutely love your TH's bird!! This card is so pretty. I love the simplicity and the sentiment, your bird is colored so beautifully. How fun is this! What a great card, my friend -- beautiful coloring! And I"m loving that you are part of the theater - how cool! My daughter (the one keeping me from crafting lately!) is heading off to Musical theater for college in the Fall and we've been involved in it now for 4 years of high school - guess I'll have to head over to help you now - LOL! Blessings to you!